Tomatoville® Gardening Forums Index > What Else Do You Grow? > Miscellaneous Edibles > Alliums > Garlic up early... good or bad? The garlic is coming up way faster than it has the last two years. It was planted Sep 27 after the weather finally cooled off a bit and then the 90's came back. One variety, the Maiskij, started poking up just seven days later. I took this pic of the Maiskij this morning, the 12th day after planting. About 4-6” tall on average. On the other side of the bed, the Scilla only has one or two up as it’s done the past two falls. I don't know if this early push is a good or bad thing. Does anybody know? It's mulched so hopefully the soil is staying cool. Temps are supposed to break and cool off next week. On a hunch I checked my daily temperature data for the Sep-Oct ‘16, ’17 and ’18. Then I figured an average daily temp for the time between day of planting and day of first poking up. No significant variance. However for the month as a whole, this September was hot; the average daily temp was five degrees above the past two Septembers. We had 20 days with highs above 90. The previous two Septembers had 11 and 7 respectively. My guess is that the soil temp was a lot warmer this year at planting time but I don’t have any data on that. If that is the cause, it seems that the Maiskij has been affected a lot more than the Scilla. I guess we’ll see if it has any overall effect on the Maiskij in the long run. Maybe ready earlier next spring? I am also in Georgia. I was planning on planting garlic last week, then I put it off. I may plant tomorrow since we are expecting 2-3 inches of rain. I believe you should be fine since, hopefully, the crazy hot days are over. Good luck! I usually don't plant until October here but I have had years when the leaves got taller than I expected due to a warm Fall but there was no detrimental effect on the heads when i harvested. Curious why you guys in the south would be planting so early (relative to those of us up here in zone 7) that plant late October - November to avoid the warm fall weather that would promote lots of top growth going into winter. 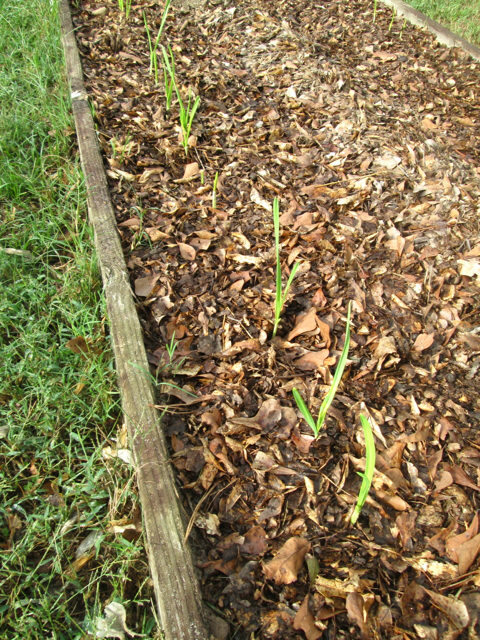 Before my first planting in fall '16, I read Georgia Extension's page on garlic and that said to plant late Sep-Nov. " For highest yields, therefore, the cloves must be planted early enough to permit the development of large vegetative plants during the short cool days of late winter. The yield potential of the plants depends on the amount of vegetative growth before bulbing commences. " Soooooo, I planted late September to get the longest growing window. Also, those first seed garlic bulbs I ordered arrived around Sep 6th and being a garlic newbie I didn’t know how long I could hold them before planting. They made a super crop so I repeated the planting time last year. Why mess with success? And we rarely have cold enough winter weather to damage onion and garlic tops. This fall I’ve had the added pressure of getting the garden in and on autopilot because I’m having knee surgery next Wednesday when a 16 year old knee replacement gets replaced. I’ll be out of gardening commission for a while and my sister Pickles will be doing the tending. However I think that I will push planting back into October next fall. I have one coming up too from a failed attempt last year. If winter isn't cold enough to damage the tops, then it shouldn't be any harm? I don't know about the turbans, but our hardnecks here put up with a lot of cold and frosty weather in some springs. We did have a bit of leaf damage this past year when it snowed in June - several times! - and I suppose it may have affected bulb size as this was not our best year (for any of the garlic growers I know locally) but certainly had no effect on survival afaict. I am planting garlic for the first time this fall. From info I have gotten from local garlic growers I am going to plant the end of Oct. I will see what happens and learn as I go.